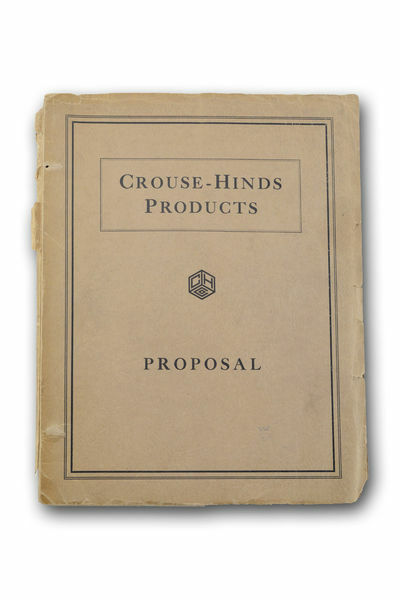 viaLibri ~ Crouse-Hinds Products: Proposal [wrapper title]. Syracuse, N. Y.: Crouse-Hinds, 1934. First edition.. Chipping to the spine of the folder, with loss; a few outer edges of oversized pages chipped; in good condition.. Brad-bound printed folder collecting 2 price lists and 26 technical bulletins dated 1932-1934 from the floodlight company (each generally 2-4 pages, though a 56-page Airport and Airway Lighting Equipment catalog with illustrated wrappers is bound in). Illus. Of especial interest among the sales brochures for the RCD8 floodlight for auto lifts and FCS-8 underwater floodlights for swimming pools and the floodlighting plans for hockey rinks, one finds the illustrated 4-page Bulletin 46-F (May 1, 1934), ìBaseball Field Lighting: A Combination Open and Closed Floodlight Installation.î Crouse-Hinds here uses the recent installation of its lights at Red Wing Baseball Stadium in Rochester, N.Y. as an example of the benefits of combining both open and closed floodlights for optimal economy and lighting, with a few side notes from the company on layout, lighting the scoreboard, and technical specs. Though night baseball had been catching on around the minor leagues since 1930, the first major league night ball game didnít occur until the Cincinnati Reds hosted the Philadelphia Phillies at Crosley Field on May 24, 1935.